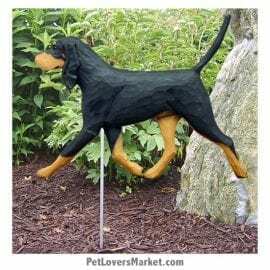 Do you love Coonhounds? So do we! 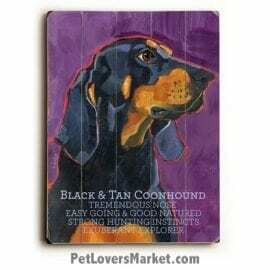 Bluetick Coonhounds and Black & Tan Coonhounds are wonderful dogs. 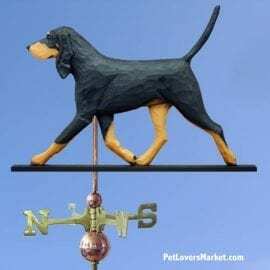 Below is our collection of dog pictures, dog decor, and garden decor — featuring the Coonhound dog breed. 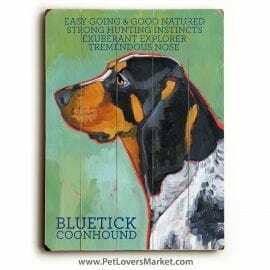 Show your love for Coonhounds with our dog art featuring this wonderful breed! Our dog pictures and dog decor make great gifts for dog lovers. We offer high quality prints on wood, showcasing your favorite dog breeds. Temperament: Intelligent, fast, muscular, need exercise and activity. 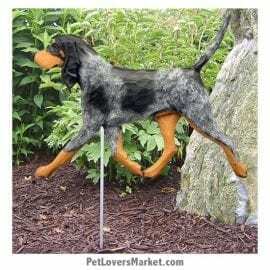 Bred for hunting, Bluetick Coonhounds can be barkers and howlers. Average Height: 1 foot 11 inches to 2 feet 6 inches. Average Weight: 45 to 100 pounds. Average Life Span: 10-12 years. Temperament: Outgoing, friendly, independent, stubborn. Needs training and exercise. 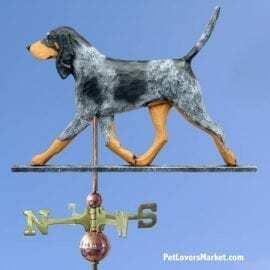 Howls like most hound dogs. Average Height: 1 foot 11 inches to 2 feet 3 inches. Average Weight: 75 to 100 pounds. Average Life Span: 10-12 years.